Can Tipping Points be Predicted? “Tipping point” can be a scary term when used in reference to climate change. It conveys that we’re past the point of no return and that the Earth is damaged beyond repair. A tipping point might seem less daunting—and even preventable—if we knew when to expect it. 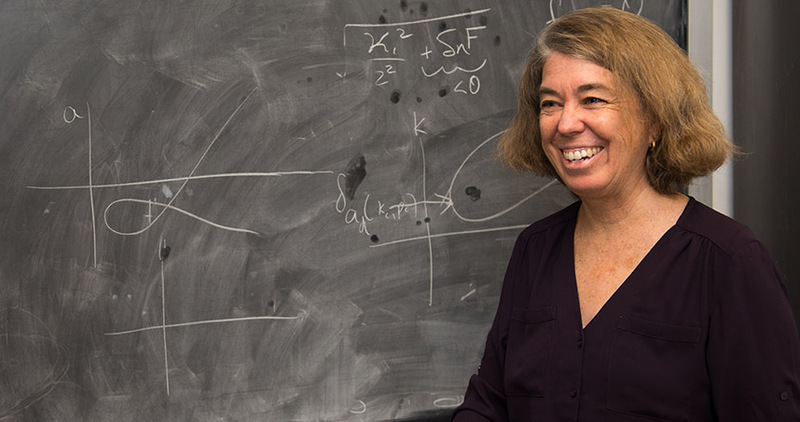 Northwestern University’s Mary Silber is using mathematics to determine whether or not it’s possible to anticipate when Earth’s climate may be on the brink of an abrupt transition. According to Silber, the colloquial term “tipping point” is slippery and mathematically ill defined. Before she could work on the problem, Silber needed to settle on tipping point characteristics that would suggest their mathematical framing: a threshold that is irreversibly crossed, creating a significant qualitative change. This fits with her extensive knowledge of bifurcation theory, a well-established mathematical framework that explains and models how a small, smooth change in a system can cause a sudden, dramatic change overall. Silber studies semi-arid ecosystems that appear to be nearing a dangerous threshold. Climate change may make them increasingly arid, pushing them into deserts. Silber looks at these ecosystems as complex systems and examines how climate-tipping events correspond to bifurcations. Climate is a complex system, and Silber thinks that inherent chaos and model uncertainties may make prediction of Earth’s tipping points impossible. But this is a challenging problem that Silber does not want to ignore. Funded by the National Science Foundation’s Mathematics and Climate Research Network, Silber and her research group are developing the mathematics that will identify robust and universal qualitative phenomena associated with complex systems, such as climate. Silber also does observational work by examining satellite images of vegetation patterns that are emerging in semi-arid ecosystems, including regions in Niger and Sudan. The vegetation shifts as water diminishes, forming stripes or arranging into leopard-like spots. She views these designs as Turing patterns, which develop through a mechanism devised by mathematician Alan Turing in 1952 that explains naturally occurring patterns. She hopes to reconcile Turing’s mechanistic explanations of natural phenomena with data. In a previous paper completed with Hermann Riecke, professor of engineering sciences and applied mathematics, and PhD student Karna Gowda, Silber used bifurcation theory to analyze vegetation pattern formation mathematically, in models that capture feedback loops between plants and water. She said that spatial pattern formation associated with these feedbacks might be able to tell us more about the timing of sudden transitions associated with an ecosystem’s collapse under climate change.